In a slight diversion from the So you wanna open a brewery? series of posts (returning with Part III next week), I thought it might be helpful to potential home brewers out there to document the fairly simple process I use for all-grain brewing at home. It's possible to spend many hundreds or even thousands of pounds on equipment when you really don't need to do that in order to make good beer. That's not to say you won't do that once you've caught the bug, of course! 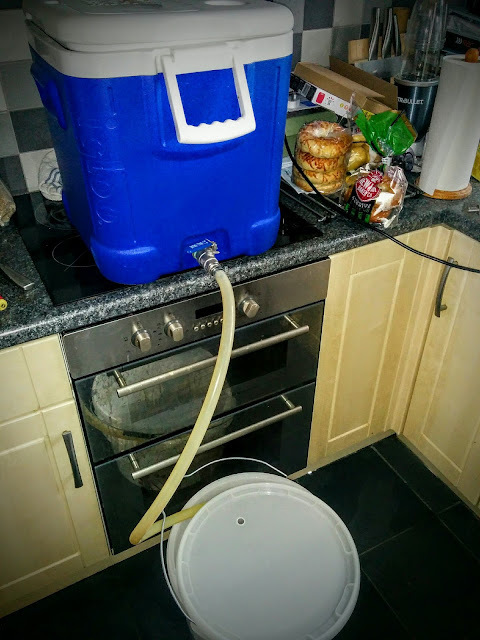 I have two separate setups at home - my original 20L setup which has a cool box mash tun and plastic HLT/kettle (shown below, total cost about £200) and a 100L gas-fired stainless setup which I use for larger brews. This will become my pilot kit at Elusive combined with a 0.5BBL conical fermentor. It's fair to say most of my home brewing is done in the kitchen on the smaller rig and that's the one I'll cover here. The mash tun was purchased from The Home Brew Shop in Aldershot. It's the one shown here. It has probably cost me about £1 per brew by this stage and is still going strong. I use a Peco Electrim boiler as a combined HLT and Kettle. The one shown here is a bit more fancy than mine which doesn't have the external digital control, although I did add a hop filter and ball valve with barb to mine as shown here. Heat the strike liquor in the kettle while cleaning the mash tun and weighing out the grains and any liquor treatment salts. I'll usually give the MT a rinse through with boiling water and check the outlet and false bottom are free of grain debris. I'll also prepare a bucket of StarSan by mixing 7ml of concentrated solution with 5L of the Tesco bottled water (about £1.20) in a small plastic flexi-tub. I'll use this throughout the day - if in doubt, dunk it in! Once the liquor is up to temperature, I'll mash in and measure and adjust the temperature as needed using cold or very hot water until I'm at the desired mash temperature - usually around 65-66C. I use a kitchen thermometer for this which has an external probe I can safely leave in the mash as I stir. Something like this (you can get them cheaper). With practice, you'll probably be able to avoid the need to adjust the temperature by getting the liquor just right for your setup and the ambient grain temperature. I'll then re-fill the kettle and leave the sparge liquor to warm while the mash is left to rest. This usually works out well time-wise so it'll be up to temperature by the time you start sparging. After the desired mash rest time, I'll use a 2L plastic jug to recirculate until the wort runs clear. Basically opening the tap (initially only partially) and filling the jug with wort then slowly and carefully pouring the jug contents back over the mash being careful to not disturb the mash bed. Once the wort is running clear, I'll run off into a plastic fermentation bucket, which I'll have cleaned thoroughly then rinsed with boiling water before rinsing with StarSan. From this point on (and especially post boil), sanitation is key and something I pay a lot of attention to! As the wort runs off, I'll slowly add sparge water using the same 2L plastic jug and gentle pouring method over the entire mash, again taking care not to disturb it too much. Once I've run off the right amount of wort, I'll empty the remainder of the sparge liquor from the kettle and use my trusty (cleaned, again!) jug to move the first few litres of wort into the kettle until I'm able to safely lift and pour the remainder in. The wort will then be boiled as per the recipe and then allowed to cool slightly. 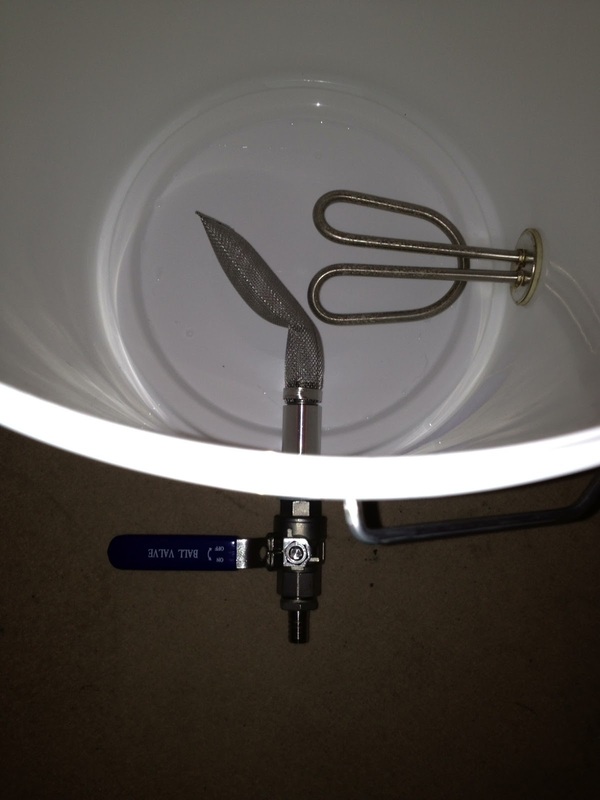 I'll manually create a whirlpool with my mash paddle to encourage trub to drop below the tap and hop filter while the first few degrees are lost. Once the trub has dropped and the wort looks clear in the kettle I'll run the hot wort off into the same plastic FV, which will have been fully sanitised for a second time, then stick the lid on with the airlock hole bunged up. Sanitisation is now hugely important! The FV will then be sat in a cold bath until the wort has reached the desired pitching temperature, which usually takes a couple of hours depending on the water temperature. As it initially cools, you'll need to let the steam out of the FV or the lid will pop off. In summer I'll add ice to the bath to bring the ambient mains water temperature down. In summary, most of the beer I've produced at home has been made using only a mash tun, a combined HLT/kettle, a plastic bucket and a plastic jug. Learning and refining the overall process (and of course your recipes!) is far more important than spending lots of money on expensive kit. I would ideally use a wort chiller (my bigger kit has a plate chiller) but I've got an annoying tap in the kitchen which would mean having to run hoses about the place from the garden. I've managed fine without one though and they aren't especially cheap. If you're really on a budget, have a look into the BIAB approach. You can achieve great results using that method and it won't cost as much as the kit shown here. Also, if you're the hands-on type, you can certainly save money by making or modifying your own kit, for example converting an existing cool box rather than buying a pre-converted one. Thanks for posting this! I might be a bit geeky, but I always find the fiddly details of other peoples' processes pretty fascinating. i) Do you do the whole "remove and clean the heating element" routine with the Peco, and if so, how much of a faff is it? ii) I'm having trouble visualizing how you get the last of the wort off the trub - do you have to tilt the boiler at the end or something to get all the clear stuff to run off? Glad you found it interesting Dave. Actually I used to use a stockpot on an electric hob too - my first 3-4 batches were made like that before I got the Peco. I've never removed the element from it. I clean it immediately after emptying with a light scourer and find that gets most of the gunk off. I'll soak it in PBW or similar if it gets too grubby. For the last of the wort, I do tip the Peco forward then just watch so I don't sent too much trub down the hose. Various replica parajumpers jackets are provided, including replica parajumpers jackets，copy parajumpers kamizelka meska，replica parajumpers kurtki damskie.